Offering you a complete choice of products which include glass heat exchanger, heat exchangers component and shell and tube heat exchangers. We are the manufacturer ,supplier and expoter of GLASS HEAT EXCHANGER . We are engaged in manufacturing, supplying and exporting supreme quality Heat Exchangers Component to our clients at market leading prices. These heat exchangers are designed and developed in tandem with set industry norms and guidelines, using optimum quality metal, which is sourced from some of the authentic vendors of the industry. In addition to this, these products are installed in various industries for the purpose of transferring heat from one medium to another. Besides, we make these Heat Exchangers Component available to the clients in varied specifications, in order to meet their diverse requirements. There are two basic type of heat exchanger, namely Shell & Tube type and Coil type. Shell & tube type heat exchangers are available with glass tube and glass or Mild Steel (MS) Shells according to set industry standards. The end bonnets and shell can be supplied in varieties of material of construction e.g., SS, CS, FRP, PTFE lined, glass lined, and more, relying on the condition of process. Also, Silicon Carbide can also be used for exchangers as per requirement. 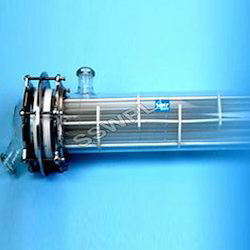 Shell & Tube Heat Exchanger have a cylindrical shell which utilizes a glass tube bundle. All the tubes are fitted in the tube sheet. There is a sealing of PTFE 'O' ring in each tube at both the ends of the tube sheet. Glass coil type heat exchangers are acquirable as boilers, condensers or immersion type units having up to 8m2 of heat transfer area. No internal sealing problems occur in this coil owing to its welding to the shell making a one piece unit. 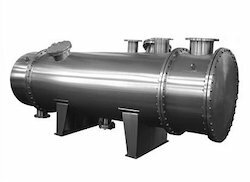 Both the heat exchangers are offered in a broad range of nominal bores and are completely suitable for pipeline components and glass process plant. The standard flat buttress of glass heat exchangers have end connection with the exclusion of service connections in some of the smaller units. We are the manufacturer , supplier and exporter of shell and tube heat exchangers .